© 2017 Dubina et al. The proximal humerus is a common location for both primary and metastatic bone tumors. There are numerous reconstruction options after surgical resection. There is no consensus on the ideal method of reconstruction. A systematic review was performed with a focus on the surgical reconstructive options for lesions involving the proximal humerus. A total of 50 articles and 1227 patients were included for analysis. Reoperation rates were autograft arthrodesis (11%), megaprosthesis (10%), RSA (17%), hemiarthroplasty (26%), and osteoarticular allograft (34%). Mechanical failure rates, including prosthetic loosening, fracture, and dislocation, were highest in allograft-containing constructs (APC, osteoarticular allograft, arthrodesis) followed by arthroplasty (hemiarthroplasty, RSA, megaprosthesis) and lowest for autografts (vascularized fibula, autograft arthrodesis). Infections involving RSA (9%) were higher than hemiarthroplasty (0%) and megaprosthesis (4%). Postoperative function as measured by MSTS score were similar amongst all prosthetic options, ranging from 66% to 74%, and claviculo pro humeri (CPH) was slightly better (83%). Patients were generally limited to active abduction of approximately 45° and no greater than 90°. With resection of the rotator cuff, deltoid muscle or axillary nerve, function and stability were compromised even further. If the rotator cuff was sacrificed but the deltoid and axillary nerve preserved, active forward flexion and abduction were superior with RSA. Various reconstruction techniques for the proximal humerus lead to relatively similar functional results. Surgical choice should be tailored to anatomic defect and functional requirements. Keywords: Reconstruction, Megaprosthesis, Allograft, Shoulder, Proximal Humerus, Tumor. The proximal humerus is a common location for both primary and metastatic bone tumors. Numerous reconstruction and stabilization options after surgical management exist including allograft, alloprosthetic composite (APC), megaprosthesis, and more recently, reverse shoulder arthroplasty (RSA). The main goals of reconstruction are to restore function and limit complications. Patient activity, tumor characteristics, and anatomic involvement are important factors to consider when selecting the optimal reconstruction. There is no consensus on the ideal method of reconstruction. There are numerous case series, but there is a lack of high-level comparative evidence between different options. The purpose of this study was to extensively review the existing literature. 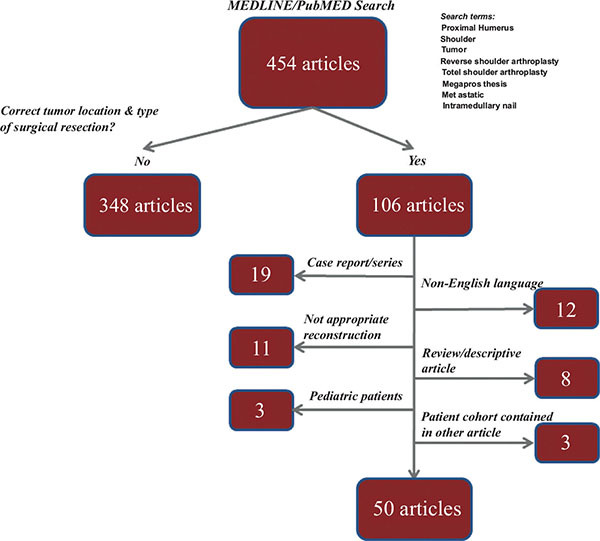 A systematic review of English-language literature was performed of PubMed and Medline/Ovid electronic medical databases with a focus on surgical reconstructive options for resection of proximal humerus bone lesions. All articles published as of September 1, 2015 were subject to review (Fig. 1). Articles were excluded if they were cases series of less than 5 total patients or if scapular resection was performed. Fifty articles were included for analysis (Table 1). Fig. (1). Flowchart summary of search methodology. Table 1. Summary of data from literature review on proximal humeral reconstruction. Each study was reviewed and pertinent data was recorded including patient demographics, length of follow-up, primary versus metastatic tumor, range of motion, rate of reoperation, infectious complications, and mechanical complications (dislocation, shoulder instability, peri-prosthetic fracture, prosthetic loosening). Post-operative functional scores were recorded when available. Data was sorted by reconstruction method. Complication rates and functional scores were calculated (Table 2). Table 2. Summary of reconstruction techniques and complications. A total of 50 articles and 1227 patients were included for analysis. The mean age of patients in the available data was 38.7 years of age with a mean post-surgical follow-up of 70.5 months. There were 30 studies qualified as Level IV evidence, 17 as Level III, and 3 studies as Level II evidence . The method of reconstruction with the most published evidence was megaprosthesis. Hemiarthroplasty had relatively few articles dedicated to its use in tumor reconstruction, but likely is more widely used for humeral head lesions, particularly in metastatic scenarios. Reverse shoulder arthroplasty is a relatively newer option and has less long-term evidence than megaprosthesis or allograft reconstruction. Mechanical complications were relatively high for all arthroplasty options ranging between 20-29%. Both allograft and autograft arthrodesis had relatively low mechanical complications (17-21%). Osteoarticular allografts had among the highest rate of mechanical complications (46%) and reoperation (34%) (Table 3). Of the arthroplasty options, megaprosthesis had the lowest reoperation rate (10%). Infection was relatively low for both megaprosthesis (4%) and hemiarthroplasty (0%). Reverse arthroplasty had a greater than double higher infection rate (9%). Table 3. Summary of mechanical complications. Vascularized fibula has a relatively high number of published cases. It has a low rate of infection (0%) and few mechanical complications (17%), but similar levels of reoperation (14%) to other methods of reconstruction. Claviculo Pro Humeri is a rare procedure and has very high rates of mechanical complications (47%) and infection (21%). A variety of scores were used to assess postoperative function with the Musculoskeletal Tumor Society Score being the most consistently reported . The functional outcomes were similar amongst different reconstruction options, ranging from 66% to 83%. For active range of motion, patients were generally only able obtain abduction between 45° to 90°. With resection of the rotator cuff, deltoid muscle or axillary nerve, function and stability were significantly compromised. The effect of glenoid resection varied amongst studies. If the deltoid and axillary nerve were preserved, the ability to regain active forward flexion and abduction was significantly better with RSA. To achieve external rotation with RSA, muscle transfer was occasionally necessary to compensate for a deficient posterior rotator cuff. Pain scores were not specifically reported in the majority of studies. Given the collection of available data from over 50 articles and 1200 patients, favorable results in most situations can be expected albeit with limited functional outcomes. Patients with extensive tumor involvement in the proximal humerus often require creative reconstruction solutions, leading to wide variability between studies and even within one institution. It should be noted that although the functional scores between reconstruction methods are similar, there is a wide spectrum of post-resection/pre-reconstruction bone and soft tissue compromise. This phenomenon can be interpreted that either a modest functional outcome is usually achievable regardless of reconstruction method or that with increasingly complex situations, increasingly complex reconstructions can achieve similar functional levels as less complex situations. If one believes the more nihilistic former approach, then it makes sense to pursue the simplest option with the least risk of complications. If one believes the latter, then reconstruction should be tailored to the specific anatomic scenario with some consideration to the patient’s physical demands and tolerance for complications. Because numerous reconstructive options are available, adequate margins should always be endeavored based on the clinical situation in order to minimize the risk of local recurrence, particularly for more aggressive phenotypes. For patients with limited estimated lifespan such as in the setting of metastatic disease and in situations which postoperative radiation and chemotherapy are required, reconstructive options that allow early weight bearing and use of the shoulder and that do not rely on bone healing such as prosthetic replacement are preferred. Hemiarthroplasty is useful for minor bone loss situations such as primary malignant tumors limited to the humeral head and metastatic lesions not amenable to intramedullary nailing. Because shoulder function with hemiarthroplasty is dependent on the integrity of the rotator cuff and greater tuberosity which is often compromised by tumor involvement it is not surprising that functional scores are limited. Although the mechanical complication rate was relatively high in this systematic review, it can be partially attributed to the frequency of subluxation requiring soft tissue reconstruction [3, 4]. Glenoid wear can be expected in young patients with hemiarthroplasty , but most oncological patients requiring hemiarthroplasty are >50 years old. Conversion of a painful hemiarthroplasty to total shoulder arthroplasty lead to a high rate of unsatisfactory results . Current revision long-stem humeral stems allow surgeons to cement a hemiarthroplasty slightly proud and compensate for a limited bone defect of the medial calcar. For more extensive bone loss, megaprostheses are a relatively simple solution. This study group of over 700 patients includes a variety of prostheses and pre-reconstruction bone deficits. Consequently, there is a wide spectrum of functional MSTS scores in this group (55-82%). Active range of motion after megaprosthesis reconstruction is largely dependent on healing of the tendon-prosthetic interface, which is unpredictable at best. Nevertheless, the overall complication rates for megaprostheses were relatively favorable with limited infections (4%), revision surgery (10%) and mechanical complications (17%). No study had an infection rate greater than 10% and multiple studies reported 0% [7-10]. Additionally, mechanical complications were commonly treated conservatively including subluxation, dislocation, prosthetic loosening, and periprosthetic fracture. The clinical context for RSA is unclear. Situations in which sacrifice of the rotator cuff is necessary but preservation of the deltoid insertion and axillary nerve is possible, RSA may be considered. For non-oncological situations, RSA is conventionally reserved for older, lower-demand patients because longevity of modern implants are unknown and there is risk of a ‘tired deltoid’ at ten years . It is also often reported to have a higher complication rate than other arthroplasty options . For oncologic patients, an older, lower-demand demographic is typically an indication for less functionally aggressive options such as megaprosthesis or hemiarthroplasty. Many elderly oncology patients require their upper extremities to push oneself out of a chair or to support themselves due to lower extremity weakness. This motion (extension, adduction, external rotation, axial loading) predisposes them to dislocation of RSA. Additionally, the higher infection rate (9%) may delay postoperative chemotherapy or radiation therapy. For younger individuals, they will likely encounter many or more of the same complications with RSA as young non-oncologic patients. For high demand, younger patients requiring resection distal to the deltoid insertion, an alloprosthetic composite (APC) may be advantageous to allow for tendinous reattachment to preserved allograft tendon insertions. However, APC is a technically more challenging procedure and has a much higher rate of complications requiring revision than megaprosthesis including fracture and nonunion. The functional results for APC are similar to other reconstructive options and so the risks and benefits need to be carefully weighed. Osteoarticular allografts are less frequently used since the advent of improved prosthetic options. With a high rate of complications requiring reoperation, numerous fractures and a lengthy time to union, there are no highly compelling reasons to choose osteoarticular bulk allografts in oncologic situations. Several articles report rates of mechanical failure in over 60% of cases [13-16]. Autologous vascularized fibular grafts, with or without allograft supplementation, on the other hand, have superior results and fewer complications. If early fracture is avoided, the graft has the ability to hypertrophy, to avoid infection and unite with the native bone to a greater extent than allograft or non-vascularized autograft. Claviculo-Pro-Humeri (CPH) similarly provides a biologic reconstruction option as the ipsilateral clavicle functions as a rotational bone flap to replace the resected proximal humerus. Its principle advantage is the construct’s inherent proximal stability through the acromioclavicular ligaments. It reportedly has the best functional outcomes of all reconstruction options, but is limited to pediatric patients and may often require reoperation for nonunion . Arthrodesis is traditionally limited to young adult patients expected to subject their shoulders to high levels of physical stress and to patients undergoing salvage of a failed limb-sparing reconstruction. Both allograft and autograft options appear to yield similar rates of mechanical complications and infection. Remarkably, functional scores are also similar to other motion-preserving reconstructions and are similar between primary or secondary arthrodesis . Patients are able to compensate through preserved scapulothoracic and elbow motion. In conclusion, hemiarthroplasty is the simplest option for minimal bone loss. For loss of the rotator cuff and deltoid insertion/axillary nerve, RSA and APC, respectively, provide potential for greater function, but have higher complications than megaprosthesis and the risks and benefits need to be carefully considered. Autograft arthrodesis, vascularized fibula, and CPH are effective in certain situations. Wright JG, Swiontkowski MF, Heckman JD. Introducing levels of evidence to the journal. J Bone Joint Surg Am 2003; 85-A(1): 1-3. Enneking WF, Dunham W, Gebhardt MC, Malawar M, Pritchard DJ. A system for the functional evaluation of reconstructive procedures after surgical treatment of tumors of the musculoskeletal system. Clin Orthop Relat Res 1993; (286): 241-6. Moran M, Stalley PD. Reconstruction of the proximal humerus with a composite of extracorporeally irradiated bone and endoprosthesis following excision of high grade primary bone sarcomas. Arch Orthop Trauma Surg 2009; 129(10): 1339-45. Kitagawa Y, Thai DM, Choong PF. Reconstructions of the shoulder following tumour resection. J Orthop Surg (Hong Kong) 2007; 15(2): 201-6. Parsons IM IV, Millett PJ, Warner JJ. Glenoid wear after shoulder hemiarthroplasty: Quantitative radiographic analysis. Clin Orthop Relat Res 2004; (421): 120-5. Carroll RM, Izquierdo R, Vazquez M, Blaine TA, Levine WN, Bigliani LU. Conversion of painful hemiarthroplasty to total shoulder arthroplasty: Long-term results. J Shoulder Elbow Surg 2004; 13(6): 599-603. Gebhart M, Dequanter D, Vandeweyer E. Metastatic involvement of the humerus: A retrospective study of 51 cases. Acta Orthop Belg 2001; 67(5): 456-63. Fabroni RH, Castagno A, Aguilera AL, Steverlynck AM, Zeballos J. Long-term results of limb salvage with the Fabroni custom made endoprosthesis. Clin Orthop Relat Res 1999; (358): 41-52. Sharma S, Turcotte RE, Isler MH, Wong C. Experience with cemented large segment endoprostheses for tumors. Clin Orthop Relat Res 2007; 459(459): 54-9. Bos G, Sim F, Pritchard D, et al. Prosthetic replacement of the proximal humerus. Clin Orthop Relat Res 1987; (224): 178-91. OConnor MI, Sim FH, Chao EY. Limb salvage for neoplasms of the shoulder girdle. Intermediate reconstructive and functional results. J Bone Joint Surg Am 1996; 78(12): 1872-88. Getty PJ, Peabody TD. Complications and functional outcomes of reconstruction with an osteoarticular allograft after intra-articular resection of the proximal aspect of the humerus. J Bone Joint Surg Am 1999; 81(8): 1138-46. Potter BK, Adams SC, Pitcher JD Jr, Malinin TI, Temple HT. Proximal humerus reconstructions for tumors. Clin Orthop Relat Res 2009; 467(4): 1035-41. DeGroot H, Donati D, Di Liddo M, Gozzi E, Mercuri M. The use of cement in osteoarticular allografts for proximal humeral bone tumors. Clin Orthop Relat Res 2004; (427): 190-7. Calvert GT, Wright J, Agarwal J, Jones KB, Randall RL. Is claviculo pro humeri of value for limb salvage of pediatric proximal humerus sarcomas? Clin Orthop Relat Res 2015; 473(3): 877-82. Fuchs B, OConnor MI, Padgett DJ, Kaufman KR, Sim FH. Arthrodesis of the shoulder after tumor resection. Clin Orthop Relat Res 2005; (436): 202-7. Salzer M, Knahr K, Locke H, et al. A bioceramic endoprosthesis for the replacement of the proximal humerus. Arch Orthop Trauma Surg 1979; 93(3): 169-84. Campanacci M, Cervellati C, Gherlinzoni F, Capanna R. Endoprosthesis of the humerus: Description of a new model and its application. Ital J Orthop Traumatol 1982; 8(1): 59-65. Capanna R, Mapelli S, Ruggieri P, et al. Resection of the proximal humerus and I.O.R. modular prosthesis in the treatment of metastatic lesions. Ital J Orthop Traumatol 1988; 14(2): 143-8. Gebhardt MC, Roth YF, Mankin HJ. Osteoarticular allografts for reconstruction in the proximal part of the humerus after excision of a musculoskeletal tumor. J Bone Joint Surg Am 1990; 72(3): 334-45. Jensen KL, Johnston JO. Proximal humeral reconstruction after excision of a primary sarcoma. Clin Orthop Relat Res 1995; (311): 164-75. Freedman EL, Eckardt JJ. A modular endoprosthetic system for tumor and non-tumor reconstruction: Preliminary experience. Orthopedics 1997; 20(1): 27-36. Probyn LJ, Wunder JS, Bell RS, Griffin AM, Davis AM. A comparison of outcome of osteoarticular allograft reconstruction and shoulder arthrodesis following resection of primary tumours of the proximal humerus. 1998; 2(3-4): 163-70. Asavamongkolkul A, Eckardt JJ, Eilber FR, et al. Endoprosthetic reconstruction for malignant upper extremity tumors. Clin Orthop Relat Res 1999; (360): 207-20. Wada T, Usui M, Isu K, Yamawakii S, Ishii S. Reconstruction and limb salvage after resection for malignant bone tumour of the proximal humerus. A sling procedure using a free vascularised fibular graft. J Bone Joint Surg Br 1999; 81(5): 808-13. Rödl RW, Gosheger G, Gebert C, Lindner N, Ozaki T, Winkelmann W. Reconstruction of the proximal humerus after wide resection of tumours. J Bone Joint Surg Br 2002; 84(7): 1004-8. De Wilde L, Sys G, Julien Y, Van Ovost E, Poffyn B, Trouilloud P. The reversed Delta shoulder prosthesis in reconstruction of the proximal humerus after tumour resection. Acta Orthop Belg 2003; 69(6): 495-500. Ippolito V, Saccalani M, Ianni L, et al. Resection of the proximal humerus for metastases and replacement with RPS prosthesis. Chir Organi Mov 2003; 88(2): 165-9. Kumar D, Grimer RJ, Abudu A, Carter SR, Tillman RM. Endoprosthetic replacement of the proximal humerus. Long-term results. J Bone Joint Surg Br 2003; 85(5): 717-22. Zeegen EN, Aponte-Tinao LA, Hornicek FJ, Gebhardt MC, Mankin HJ. Survivorship analysis of 141 modular metallic endoprostheses at early followup. Clin Orthop Relat Res 2004; (420): 239-50. Mayilvahanan N, Paraskumar M, Sivaseelam A, Natarajan S. Custom mega-prosthetic replacement for proximal humeral tumours. Int Orthop 2006; 30(3): 158-62. Black AW, Szabo RM, Titelman RM. Treatment of malignant tumors of the proximal humerus with allograft-prosthesis composite reconstruction. J Shoulder Elbow Surg 2007; 16(5): 525-33. El-Sherbiny M. Reconstruction of the proximal humerus after wide resection of tumors: comparison of three reconstructive options. J Egypt Natl Canc Inst 2008; 20(4): 369-78. Scotti C, Camnasio F, Peretti GM, Fontana F, Fraschini G. Modular prostheses in the treatment of proximal humerus metastases: Review of 40 cases. J Orthop Traumatol 2008; 9(1): 5-10. Cannon CP, Paraliticci GU, Lin PP, Lewis VO, Yasko AW. Functional outcome following endoprosthetic reconstruction of the proximal humerus. J Shoulder Elbow Surg 2009; 18(5): 705-10. Piccioli A, Maccauro G, Rossi B, Scaramuzzo L, Frenos F, Capanna R. Surgical treatment of pathologic fractures of humerus. Injury 2010; 41(11): 1112-6. Raiss P, Kinkel S, Sauter U, Bruckner T, Lehner B. Replacement of the proximal humerus with MUTARS tumor endoprostheses. Eur J Surg Oncol 2010; 36(4): 371-7. Wang Z, Guo Z, Li J, Li XD, Sang HX. Functional outcomes and complications of reconstruction of the proximal humerus after intra-articular tumor resection. Orthop Surg 2010; 2(1): 19-26. Yang Q, Li J, Yang Z, Li X, Li Z. Functional outcomes and complications of reconstruction of the proximal humerus after intra-articular tumor resection. Int Orthop 2010; 34(6): 869-75. De Wilde L, Boileau P, Van der Bracht H. Does reverse shoulder arthroplasty for tumors of the proximal humerus reduce impairment? Clin Orthop Relat Res 2011; 469(9): 2489-95. Griffiths D, Gikas PD, Jowett C, et al. Proximal humeral replacement using a fixed-fulcrum endoprosthesis. J Bone Joint Surg Br 2011; 93(3): 399-403. Ruggieri P, Mavrogenis AF, Guerra G, Mercuri M. Preliminary results after reconstruction of bony defects of the proximal humerus with an allograft-resurfacing composite. J Bone Joint Surg Br 2011; 93(8): 1098-103. Bilgin SS. Reconstruction of proximal humeral defects with shoulder arthrodesis using free vascularized fibular graft. J Bone Joint Surg Am 2012; 94(13): e94. Hartigan DE, Veillette CJ, Sanchez-Sotelo J, Sperling JW, Shives TC, Cofield RH. Reconstruction of the proximal humerus for bone neoplasm using an anatomic prosthesis-bone graft composite. Acta Orthop Belg 2012; 78(4): 450-7. Li J, Wang Z, Guo Z, Wu Y, Chen G, Pei G. Precise resection and biological reconstruction for patients with bone sarcomas in the proximal humerus. J Reconstr Microsurg 2012; 28(6): 419-25. Aponte-Tinao LA, Ayerza MA, Muscolo DL, Farfalli GL. Allograft reconstruction for the treatment of musculoskeletal tumors of the upper extremity. Sarcoma 2013; 2013: 925413. Kaa AK, Jørgensen PH, Søjbjerg JO, Johannsen HV. Reverse shoulder replacement after resection of the proximal humerus for bone tumours. Bone Joint J 2013; 95-B(11): 1551-5.
 van de Sande MA, Dijkstra PD, Taminiau AH. Proximal humerus reconstruction after tumour resection: Biological versus endoprosthetic reconstruction. Int Orthop 2011; 35(9): 1375-80. Liu T, Zhang Q, Guo X, Zhang X, Li Z, Li X. Treatment and outcome of malignant bone tumors of the proximal humerus: Biological versus endoprosthetic reconstruction. BMC Musculoskelet Disord 2014; 15: 69. Bonnevialle N, Mansat P, Lebon J, Laffosse JM, Bonnevialle P. Reverse shoulder arthroplasty for malignant tumors of proximal humerus. J Shoulder Elbow Surg 2015; 24(1): 36-44. Pruksakorn D, Chantarapanich N, Arpornchayanon O, Leerapun T, Sitthiseripratip K, Vatanapatimakul N. Rapid-prototype endoprosthesis for palliative reconstruction of an upper extremity after resection of bone metastasis. Int J CARS 2015; 10(3): 343-50. Streitbuerger A, Henrichs M, Gosheger G, et al. Improvement of the shoulder function after large segment resection of the proximal humerus with the use of an inverse tumour prosthesis. Int Orthop 2015; 39(2): 355-61.